Daughter of two actors. As a fourteen year old girl she was taught in Weimar by Goethe and Corona Schröter. In 1791 she performed succesfully in Shakespeare's "Konig Johann" ("King John") . In 1793 she married the actor Johann Becker, who was thirteen years her senior. She bore him two children in rapid succession, but she died soon afterwards. Goethe heard of her death when he was in Zürich and he was deeply shocked. He wrote the poem "Euphrosyne" for her, after the last part he saw her in. In 1800 a commemorative column was placed for her in Rosenberg. In 1950 it was transported to the plot of the Marie-Seebach-Stifts at the historical cemetery in Weimar. 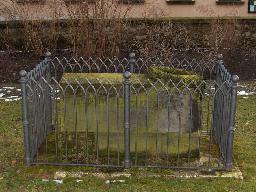 The grave of Christiane Becker-Neumann at the Jakobskirchhof in Weimar.